Whether you are just getting started or a testing expert, you've come to the right place. Here you will find webinars that will help you implement automated tests, use new features or better understand the journey to DevOps. Learn how to accelerate test execution and developer feedback through the enablement of regional test resources is essential to building customized experiences. Get Ready for Selenium 4! A must-attend webinar for all Sauce Labs customers using Selenium for testing, it outlines the best process to prepare for the release of Selenium 4. Join Sauce Labs Product Manager, Sam Coffman and Software Engineer, Christian Bromann as they discuss Sauce Headless beta, benefits of headless testing and where it fits into the pipeline. Join Selenium Conference Committee member and automated testing expert Andrew Krug as he talks about improving automated tests and addresses a few use cases in this practical and informative webinar. In this webinar you will learn how Walmart migrated from many independent, siloed teams doing manual testing to integrated teams that run over 50k automated tests daily using shared resources like Test Armada and Sauce Labs. This webinar will explore how to implement the Espresso, a widely used framework for testing mobile apps for the Android OS, on emulators. DevOps Analyst Chris Riley leads a discussion with automated testing experts as they discuss continuous testing at every point in the software development cycle. In this webinar, Omni Sourcing will showcase their integration with Sauce Analytics and customer defect management systems to spotlight the cost of testing as well as compare test efficiency over time and between releases, vendors and programs. Skip Staging! 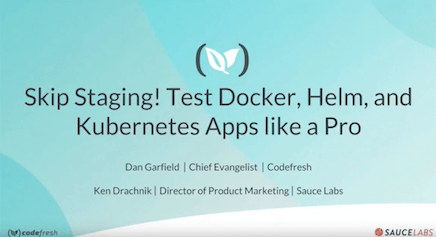 Test Docker, Helm, and Kubernetes Apps Like a Pro! Codefresh we can dramatically speed up and improve the quality of integration testing using short-lived environments. Join Gerie Owen, Vice President, Knowledge and Innovation-US at QualiTest Group and Giovanni Rago, Solutions Specialist at Sauce Labs as they discuss Test Optimisation being one of the keys to Continuous Testing. Mobile testing may seem complex. However, it can easily be done with a comprehensive strategy that includes real devices, emulators, simulators and the right testing framework. Join Pascal Joly, Director of Technology Partnerships at Quali, as he discusses DevOps and what it really means when it comes to implementing and managing it for complex application architectures. Join Patrick Poulin, CEO of API Fortress, as he provides an introduction to API testing, the best ways to test your own APIs using popular tools available today, and demonstrates the orchestration of API tests as part of a Jenkins build process. Christian Bromann will share how he built an automation driver using Appium for Smart TV applications built on the HbbTV standard. Join us as industry leaders from Sauce Labs and BlazeMeter share the essentials to building tests that scale in coverage without the brittleness of traditional automation approaches. See how to build cross-platform, cross-device, cross-application tests, all using open source components & executed on a cross device-farm solution. Learn how one can use best practices to create well-organized tests that are easy to read and can be automated in an efficient and maintainable way. 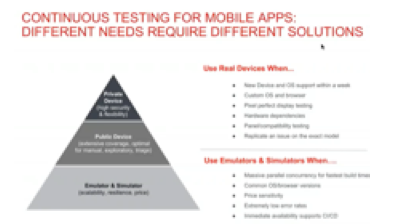 This webinar will explore how to build a mobile testing strategy based on Appium and BDD. This webinar will explore the Espresso testing framework, another widely used framework for testing mobile apps for the Android OS. Using Selenium to Test Mobile? Meet Appium! Learn how you can utilize your Selenium skills to scale your mobile testing with Appium. See how to use Sauce Analytics to track down failures by build and by test to troubleshoot faster. Take a tour of Appium Desktop and see how it can be used with the goal of making it easier to write tests for your apps. Hear how moving an in-house Selenium Grid to the Cloud helps expand test coverage and make great strides in moving to a full continuous integration workflow. Test Automation Newbie? Robot Framework Will Save the Day! Practical Tips and Tricks for Selenium Test Automation 2!